Spray the pot of the slow cooker or if using a liner bag, spray the bag well. In a mixing bowl whisk together milk, evaporated milk, egg, salt and pepper. Pour milk mixture into the crockpot. 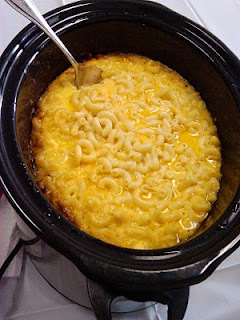 Add cheese and uncooked macaroni. Stir gently to mix. Turn slow cooker on low and cook 3-4 hours, or until the custard is set and the macaroni is tender. (Do not cook more than 4 hours, or the sides will begin to dry out). Serve at once. Jans tips: between the 3-4 hour mark on low, the edges start to get that crispy, cheesey edge. My kids love that part, but if yours don't you'll want to make this when you know you can cut it to warm or serve it at about the three hour mark.